i already love new mexico artist erin adams’ fantastic glass mosaics, because she has an eclectic aesthetic, and enjoys fusing urban influences with whimsical folk art style. however, i’m even more bonkers about her newest collection, the gorgeous, earth conscious luna tiles. 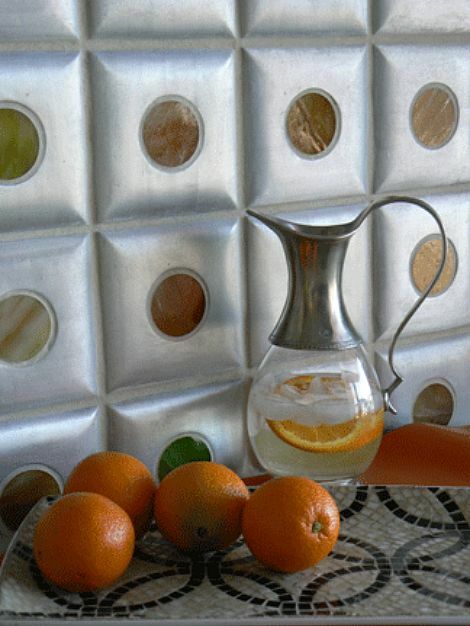 these sandblasted aluminum and glass tiles are created from recycled materials, in collaboration with alumillenium tile of mexico. erin pays close attention to the roles that color and shape play as design elements. all aluminum used is recycled, and the oil used to heat up the metal during production is recycled from automobiles. each material highlights the unique character of the other, creating a harmonious sensory experience of sight and touch. available in 36 colors and 3 finishes, to accommodate a wealth of tastes. see erin’s complete line at ann sacks. i’m cuckoo for these mosaics! this makes me want to take a class and mosaic everything in sight… you’re giving me ocd. yes, the native american-looking “throw rug” mosaic is making me insane. glad you like them too!